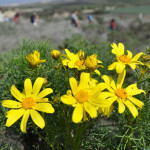 Join botanists Lauren Brown, Dirk Walters and other botanists of the California Native Plant Society of San Luis Obispo as they lead hikers to Coreopsis Hill. This is a moderate hike, about 3 hours round-trip. Dress in layers, bring water and sun screen, and have your “Dune Mother’s Wildflower Guide” by Dr. Malcolm McLeod for the trip. Heavy rain cancels this trip (light rain, bring appropriate clothing). The hike will leave from the State Parks Parking Lot at the end Of Oso Flaco Lake Road. We will have parking passes for the hike, courtesy of State Parks. We will walk back up Oso Flaco Lake Road to Beigle Road and access the dunes through private property. The access is through an active agricultural field; in appreciation of being allowed to use this access, we will review and follow all the procedures requested by the field manager on our way into and exiting the dunes.